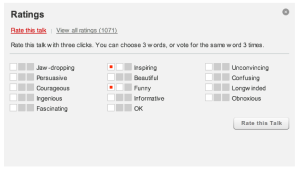 They have a wonderful way for you to rate videos. TED does something that gets past these issues, and still returns useful assessment data. Their system is very simple and very appealing – especially for those of us whose brains are wired for words rather than numbers. They give me selection of words and let me choose three, or the same word three times if I want. The data collected still tells them what people thought of the video, you can label it as persuasive, funny, obnoxious or just OK. By giving a selection rather than open fields it shepherds the viewers towards useful responses. The way the data is presented it also very cool, and very simple. 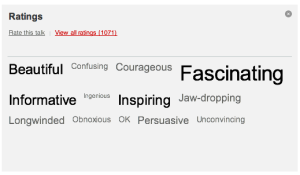 A tag cloud lets me see that most people rated this talk as fascinating. Beautiful, informative and inspiring were also common ratings. Just a few people found it confusing or unconvincing. We’ve just added the “amazon star” rating to some of our content, it was a big deal for us. But this is a whole other level, and it’s giving me more ideas.